AGONY: St Attract's missed out on silverware against Rice College. SAINT Attracta’s Community School’s perplexingly bleak stay in Heartbreak Hotel continues. 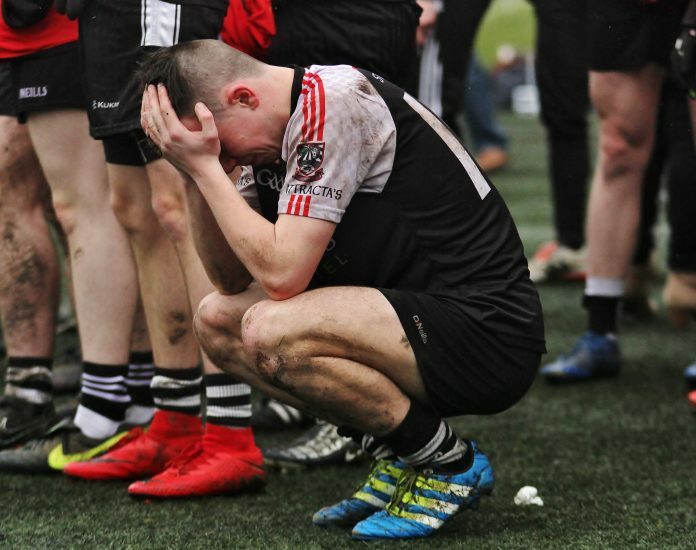 Runners-up in the Connacht GAA Post Primary Schools Senior ‘A’ Football Championship in 2014, 2016 and 2017, 2018 can now be added to this list of woe following last Saturday’s provincial final loss to Rice College, Westport, at Tuam Stadium. While Rice College’s class can’t be doubted after their six-point win, 1-13 to 0-10, especially given how well they absorbed the blow of losing midfielder Fintan McManamon to a 20th minute red card, the Mayo secondary school’s victory must be put in the context of their opponents not reaching expected performance levels. The Tubbercurry secondary school had beaten Rice College in January’s Connacht GAA Post Primary Schools Senior ‘A’ Football League decider but the rematch showed Rice College to be the superior unit. A full report on this match, plus comment from sports editor Liam Maloney and the thoughts of St Attracta’s manager Colm McGee can be found in this week’s edition of the Sligo Weekender- out now.